Another sign of a dog with a problem is a respiratory condition; coughing, sneezing/wheezing, runny nose or even runny eyes, and a third symptom may show up in the digestive system, as diarrhea or vomiting. There are certain breeds that are more predisposed to respiratory allergic conditions than others, these dogs can suffer the same as their humans when the air is filled with grass and tree pollen, dust, mildew, ragweed and mold. Such breeds as Schnauzers, Irish Setters, Boston Terriers, Scottish Terriers, Cairn Terriers, West Highland Terriers and wire-haired Terriers are among the most common affected with air type allergic reactions. Diagnosis is not an easy matter. Much is done on a hit and miss basis. To complicate matters a thyroid condition could even enter into the picture. In order to find the culprit and if the cause is not fairly evident, like a flea problem or even or a new food, a dog will have to go through a fairly lengthy and systematic diagnosis. There is no magic way to figure out the problem. Environmental problems can be handled as best you can; air conditioning in the house can reduce the chance of outside airborne allergens coning in. Dehumidifiers can reduce the problem of mold. An air cleaner with a HEPA filter will reduce dust and pollens within the household. One important thing to keep in mind if you have a dog with serious eactions and you are considering breeding it, please Do Not. You will just be adding to a situation that will cause not only other dogs' a problem, the owners who love them too. Certain breeds such as golden retrievers, schnauzers, and West Highland White Terriers are thought of by some vets, to be the most at risk for food allergy, though this has not been proven conclusively. Protein is generally the biggest culprit in causing a dog food allergy. The most common sources of protein are, beef, lamb, pork, chicken, turkey, and eggs. Since we all need protein as part of our everyday diet, it is hard to eliminate it from your dog's diet. A food allergy takes time to show its ugly face, unless it is a new food that was recently added to your pet's diet. Determining what food is causing the problem, especially if you are like me, and offer a mixed variety of foods to your pet, it will take time, patience and due diligence. It is important for the dog to be on a hypoallergenic diet for at least 4 to 6 weeks. A hypoallergenic diet consists of protein that has been predigested into very tiny bits, so the immune system does not recognize that it is there. This food can only be purchased at your vet's and is fairly expensive. Along with the special food, the whole family must be aware that the dog is not to have any other food or treats while the 4 to 6 week period is in progress. Now, this can really be a challenge, when looking into those big brown eyes. 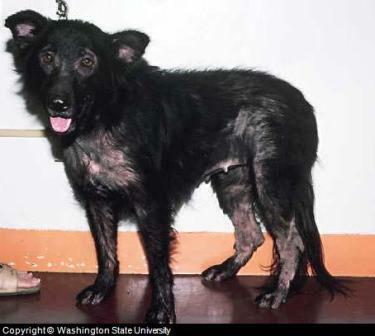 The itching should gradually disappear while the dog is on the diet, once the itching is gone and the dog has recovered. Next comes what is considered the challenge and requires patience, you restore the dog to its original diet and watch what happens. If the itching starts again, it is back on to the special food until the itching is gone again and then you begin to add your dog's other foods, one by one. This means that whatever your dog normally has been eating, you add it one food at a time and watch for a reaction. It will take several weeks for a reaction to show up and during that time, you do not feed the dog anything else, but the current food (no treats or table food). If it does not cause a problem, if is fairly safe to think that food is okay, then you add another of your dog's foods and go through the same process. Your vet will advise you as to the best way to do this, you also will be feeding the hypoallergenic food, too. Treatment can also be tricky, as your dog cannot only suffer from a food allergy, but from an inhalant allergy also. The secret here is to find the culprit that is causing the problem for your dog and ultimately and hopefully end it forever. This is not a problem that you alone can solve; allergy problems need the help of your vet, so at the first sign of an itching problem, see your vet at once. Your dog will appreciate it and so will you. While not a cure, if these problems are causing some type of skin reaction and itch, a homeopathic such as allergy itch ease might be of hellp. These work by strengthening the body's natural ability combat potential allergens.